Some friends of mine from the Homeschool Review Crew like to participate in the Five Minute Friday link up hosted by Heading Home. The idea is to set a timer and write for 5 minutes. 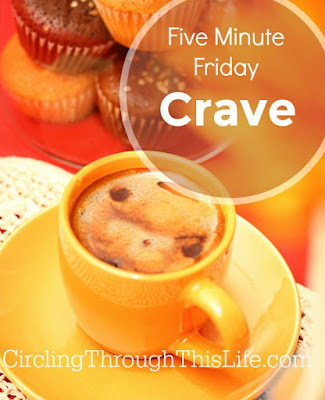 This week's word is "Crave". The first thing I think of when I hear "crave" is food. Food cravings. Craving is not just wanting but has the connotation of needing. When I can tell I am getting dehydrated I don't say that I crave water. I say I need water. But when I say someting like "I am craving Chex Mix" it is not just meeting a need such as hunger but meeting some type of psychological need? I've heard it said that craving specific foods may indicate that your body needs something that is in those foods. I don't know if that is true or not but I know that when I say I crave something it is more than just an intense "want". I don't just want the Chex Mix. I can't be sure that I need the Chex Mix but other snacks are just not going to satisfy the way a handful of crunchy cereal snack. Craving isn't just about food though. I sometimes crave some aspect of Divine Liturgy. This week I've been listening to my Church's CD because I wanted, no, needed, no was craving the beauty and worship of Divine Liturgy. Something about hearing the familiar voice of my priest and familiar hymns meet this need more than listening to Ancient Faith Radio. When thinking about "crave" I also thought about it terms of relationships. A young child craves the attention of her parents. She both needs and wants the attention. I found myself craving some extra time with my husband. Life's been crazy. We've been stressed and I was craving some simple time alone. Just Honeybear and me snuggling on the couch watching Netflix. Come join in the fun! Click on the button below to read more thoughts about "Crave"